Our research group has been exploring the concept of serious games for several months now. Aside from providing nerdy entertainment, our games collect (and distribute) biological knowledge from broad audiences of players. 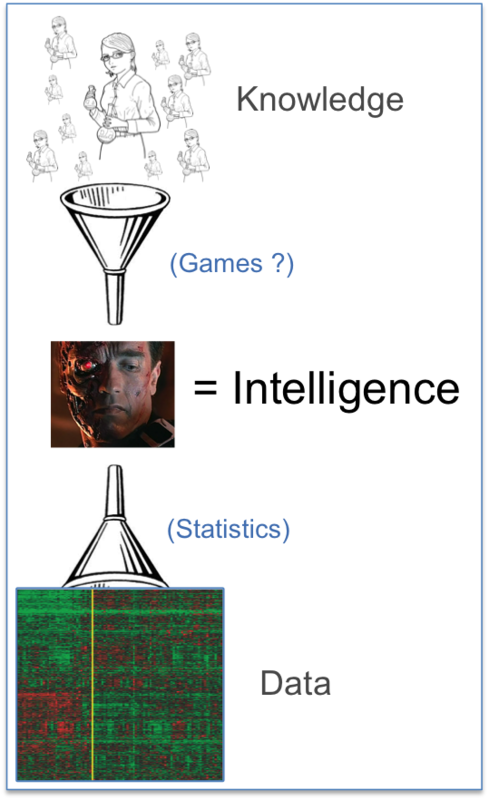 The hypothesis underlying this work is that, by capturing knowledge in forms suitable for computation, these games make it possible to build more intelligent programs. 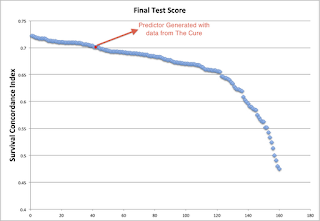 As one step in testing this general hypothesis, on Sept. 7, 2012, we released a game called ‘The Cure’. The objective of this game is to build a better (more intelligent) predictor of breast cancer survival time based on gene expression and copy number variation information from tumor samples. We selected this particular objective to align with the SAGE Breast Cancer Prognosis challenge. In this game, available at http://genegames.org/cure/, the player competes with a computer opponent to select the highest scoring set of five genes from a board containing 25 different genes. The boards are assembled in advance to include genes judged statistically ‘interesting’ using the METABRIC dataset provided for the SAGE Challenge. A game of the The Cure. Barney (the bad guy) is winning, I am looking at the CPB1 gene and, using the search feature, I have highlighted all genes that have the word cancer in any of their metadata in pink. As you can see to the right of the board, information from the Gene Ontology, RefSeq, and PubMed is provided through the game interface to aid players in selecting their genes. Players are also encouraged to make use of external knowledge sources (in addition to their own brains). 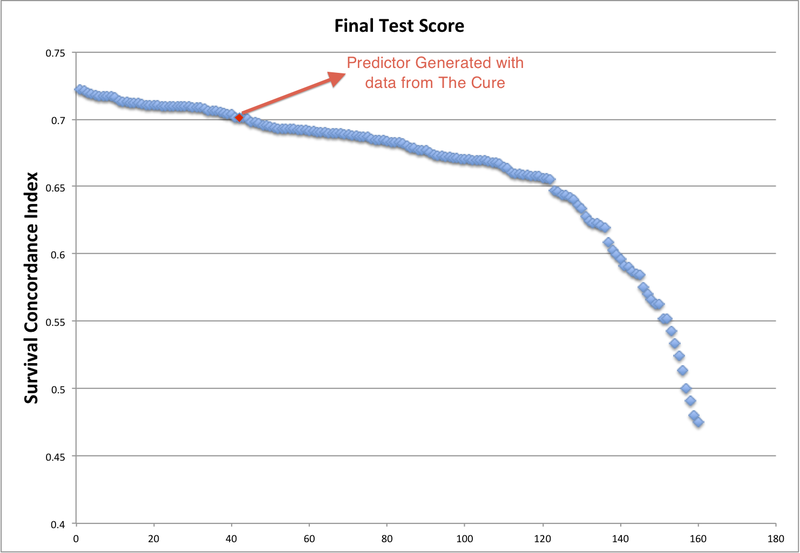 The Cure was promoted on launch day via a presentation by Andrew Su at Genome Informatics 2012, via Twitter and in several blog posts. As we first described in a post published on the Sage community site, more than 120 players registered and collectively played more than 2000 games in the first week that the game was alive - with much of this activity happening within the first few days. Nearly half of the players self-reported having PhDs and half claimed knowledge of cancer biology. Following the initial buzz, game-playing activity slowed down to what is now a slow but persistent trickle. As of last Friday, Oct. 26, 2012 we have had 214 people register and have recorded 3,954 total games (including training games). The player demographics have remained stable with about 40% PhDs, nearly 50% declaring knowledge of cancer biology, and about 50% stating that they are biologists. Aside from entertainment, the point of this particular game is to assemble a predictor for breast cancer prognosis. The main hypothesis is that biological knowledge, accessible from players, can be used to help select good sets of genes to use to train predictive models using machine learning algorithms. The premise is that injecting distributed biological knowledge (which can not entirely be learned from any one training set) will help reduce overfitting by identifying the gene sets with biologically consistent associations with disease progression. The data collected from game play includes information about the players (education, knowledge of cancer, profession) and the complete history of the genes that each player selects for each board that they play. While we are still considering methods for making use of this data (such as the Human Guided Forest), we used the following protocol to build a predictor to submit to the SAGE challenge. Filter out games from players that indicated no knowledge of cancer biology. Rank each gene according to the ratio of the number of times that it was selected by different players to the number of times that it appeared in any played game. Select the top 20 genes according to this ranking. Insert this 20 gene ‘signature’ into the ‘Attractor Metagene’ algorithm that has dominated the SAGE challenge. To do this, we kept all of the code related to the use of clinical variables unchanged, but replaced the genes selected by the Attractor team with the genes selected by our game players. In experiments conducted within the training dataset, we were able to consistently generate decision tree predictors of 10-year survival with an accuracy of 65% in 10-fold cross-validation using only genomic data (no clinical information). This was substantially better than classifiers produced using randomly selected genes (55%). Using an exhaustive search through the top 10 genes, we found 10 different unique gene combinations that, when aggregated, produced statistically significant (FDR < 0.05) indicators of survival within: (1) the training dataset used in the game, (2) a validation cohort from the same study, and (3) an independent validation set from a completely different study. !! Update, the mode submitted using the The Cure data (Team HIVE) scored 0.70 on the official test dataset for the METABRIC round of this competition, putting it at #43 of of 171 submitted models !! These early results from The Cure show clearly that biologists with knowledge that is relevant to cancer biology will play scientific games, and that combined with even basic analytical techniques, meaningful knowledge for inferring predictors of disease progression can be captured from their play. We suggest that this might open the door to a new form of ‘crowdsourcing’ that operates with much smaller, more specific crowds than are typically considered. The data collected from the game so far is available as an SQL dump in our repository. This is the entire database used to drive and track the game with the exception of personal information such as email and IP addresses. Thanks to Max Nanis, Salvatore Loguercio, Chunlei Wu, Ian Macleod and Andrew Su for all of your help making The Cure. Thanks in particular to Max who authored 99% of everything you see when you play the game. The opponent in The Cure came from a Wikipedia Commons image from the game "You have to Burn the Rope". Thanks for sharing!